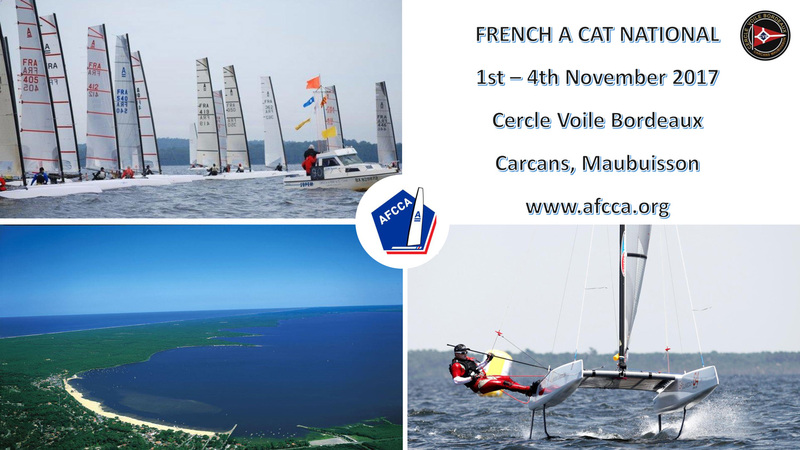 French A Cat Nationals will be held from the 1st to the 4th of November in Maubuisson, near Bordeaux, the same place than the 2014 Europeans. It's usually good flat water, windy and tactical conditions making it a very interesting and fun place to sail for either foiling or non-foiling A cats. This event will be the last regatta of the French 2017 Championship and possibly the last major event of the 2017 A-Cat European season, before storing our boats for the winter. It will also be part of a bigger catamaran event, also including the F18 French Championship. Called the 'Grand Prix de l'Armistice',it has been a French must-do for many years with 200+ boats. We already have 30 sailors who have pre-registered for this event, and we are reasonably expect between 40 to 50 boats, with some Spanish, Belgian, eventually Italians and Swiss, as Bordeaux is well connected. It should be a great event and fingers-crossed, weather will be on our side ! We encourage all foreign sailors to come and join us. The regatta will start on the Wednesday and will end on the Saturday giving you the Sunday for the trip home. The period has the French schools on holiday, so although accomodation shouldn't be a problem, it's still better to get it sorted soon.